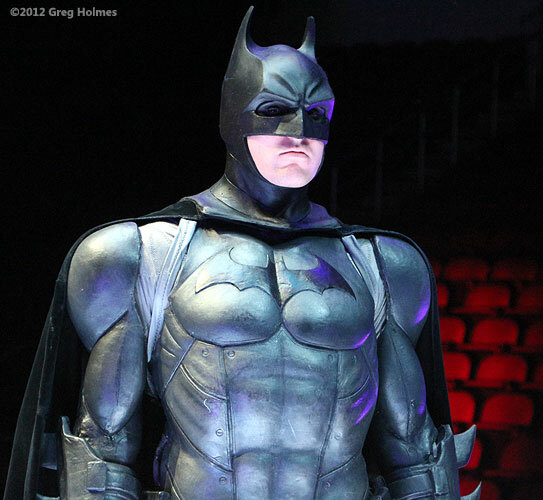 Today I attended a press preview of the Batman Live show at Intrust Arena in Wichita. Weighing the alternatives, I made the predictable decision that when one can go see Bat-stuff, one should go see a Bat-stuff. Here, actors portraying Batman and Robin pose with the Batmobile for the press. One performance was tonight and there are two left: Wednesday at 3:30 p.m. and 7:30 p.m. See Intrust's page for details. Oh yes - the Batmobile. As any comic geek knows, there have been at least a dozen renditions of these. It looks as if this is one that is more properly piloted than driven. Heralded by music and accompanied by a respectable amount of fog, the Batmobile shot from the backdrop out onto the stage, rotated and showed us its exhaust and some foreword armaments. It was actually pretty cool. So what do you think? I tell ya, if I had one of these things I'd find excuses to roll it out whenever possible: Halloween with the Scarecrow driving, Batman giving Santa a lift...heck, I'd have a caped and cowled Easter Bunny driving it on my front lawn. Why can't normal cars shoot flaming exhaust, or at least have rear-mounted fog machines with colored floodlights? How much extra would it cost to insure? And fins, baby! It's got fins! Did I mention it fires flares? The woman you saw near the beginning of the video, and later with a whip, was Emma Clifford as Catwoman. 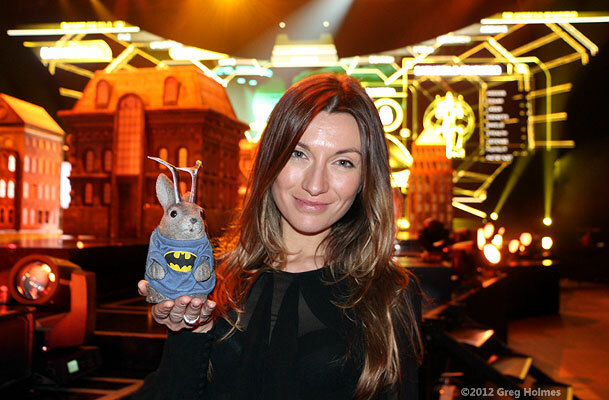 She took a moment to chat with me and pose with Ace Jackalope. Clifford, originally of London, said she was "not that comfortable with heights" when she began the role, which involves a lot of simulated flying. She also had to learn to wield that 20' bullwhip. 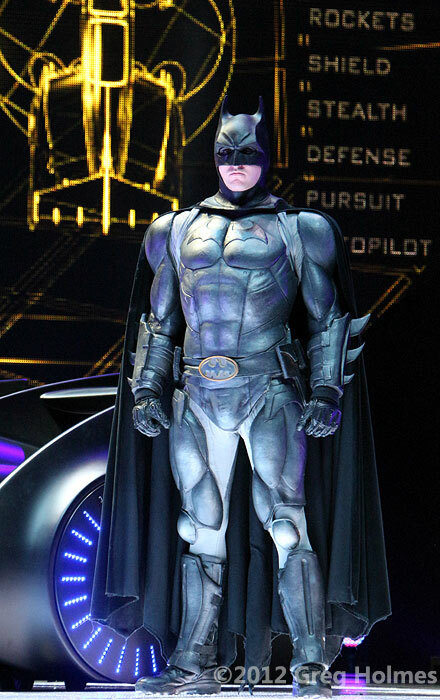 The publicity material lists three actors as playing Batman. They sure have their bat-bases covered as far as spare Dark Knights. Stoic, isn't he? Maybe because the suit weighs 40 pounds. 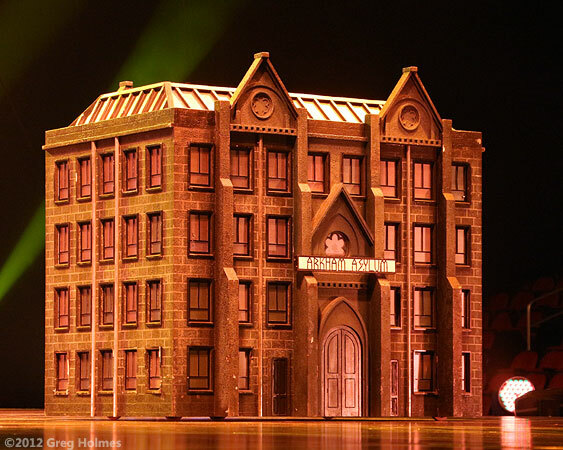 I was struck by the many model buildings of Gotham City. Imagine having this Arkham Asylum on an "O" gauge railroad layout.